OK going to do a little pruning I think! Of course don't go too mad chopping at leaves or it'll cease to be able to make energy for itself. I've never been sure if fruit itself can take energy from sunlight... I guess it does then. Chillie plants and leaves.....I've just removed a load today. There are no hard and fast rules but I generally remove any that are lower down the stem and those which are shading the Chillies. Leaves are just there to receive sunlight and feed the plant via photosynthesis, if you're regularly feeding the plants, they don't require as many leaves. The leafier the plant, the more the energy goes into saving the leaves - remove some and that energy gets re-directed into making fruit and ripening it. Tomatoes still green inside.....most varieties are, only when they're on the point of falling off the plant will most of them redden up inside. Nice and red outside is the important bit but even that isn't that important, if you pick them before they're fully red, they'll still ripen off the plant and keep for longer if you're not using them immediately. Well that was a thorough prune of both tomatoes & peppers. Can actually see into the greenhouse again! Went for most lower leaf growth, anything that looked bad and some of the higher shading leaves. Don't want to loose too much leaf growth as I foliar feed - be somewhat tricky with no leaves! Ouch that was a cold night down to 11.6c. Didn't realise we'd get it quite that cold. Hope the peppers cope ok as greenhouse is open and some plants are still out around the yard. Well that was a thorough prune of both tomatoes & peppers. Can actually see into the greenhouse again!Went for most lower leaf growth, anything that looked bad and some of the higher shading leaves.Don't want to loose too much leaf growth as I foliar feed - be somewhat tricky with no leaves! Don't go too mad, to cut a long story short you don't need to expose the fruit to sun on the plant, off the plant some heat (not necessarily sun, might help) As it happens you might make matters worse removing the sugar forming leaves. I don't want to get into an argument with anyone but I advise you look it up. My problem this year is my sweet corn plants have not grown evenly and I am convinced at least one plant is a different variety out of the packet. I have a massive crop of very nice apples, and as an example I haven't removed any leaves on that tree. I didn't go too mad really - most leaves I took out were shaded out anyway or old/ragged. I think it might help get a bit more air/light to the other plants in there - and expose the soil where slugs may be for birds to eat! Just noticed a large proportion of my ripe tomatoes have been eaten by something - large holes in the flesh.I'm thinking maybe squirrels are doing it as we have plenty of them about the area and I've seen them in my yard too. Anyone had similar problems and how did you go about ridding yourself of them? I don't have a huge garden, but, I back onto The South Downs, so it's lovely. We have plenty of squirrels who come into the garden regularly. They haven't touched any of my veg/fruit garden. I make my own fat-balls, the birds and squirrels love them - so maybe offering them something else could improve your chances! Oh, I also have a terrier who appointed himself vegetable guardian lol - p.s. no squirrels were harmed during the writing of this post. I'm fairly convinced its mice. Can see they've gone for the accessible ripe fruits and can see little bits of tomato scattered around the area. Remaining ones are harder to get at so hopefully bit more luck! Observation re flower-drop on chillis: I've got ten plants on the go, eight of which are on the front-room windowsill as it's really the only suitable one. It faces directly East and we have no windows at all on the South side despite it being a detached pad - basically it gets the most sun. Anyways ten plants were making it a little crowded so I put the two weakest looking plants outside, figuring that if I was going to lose any due to low overnight temps it'd have to be those. When the flowers appeared on all plants, I got no flower drop buts as the chillis formed then the flowers did indeed start to fall. It now seems that very few flowers last a day or two before falling but no problem 'cos my plants are already festooned with a good numbers of chillis. However... the plants outside,although looking pretty bedraggled foliage-wise aren't experiencing flower drop at all. Not one has fallen and the two plants have more chillis than the indoor ones. I'd have thought the recent chilli nights (geddit?) would have caused carnage but no. I can tell that the chillis on the outdoor plants are going to end up much smaller than the indoor ones but maybe the heat will be more intense, dunno. We've only had a couple of chillie (!) nights so far so if I do see any damage I'm expecting it to appear in the next day or so. Saying that mature plants seem less bothered than younger plants in my experience. Always seems the first bloom of flowers is dropped, then the odd actual chilli/pepper then they seem to produce loads of fruit and only drop when they have enough fruit on them. Trouble is its often August before they really get going - fine for little chillies but sweet peppers take forever to grow & ripen and we're running out of season! I'm already rapidly loosing available sunlight as its dipping behind the house ever earlier. Or as has just occurred to me, Botts - maybe the bees and insects are doing a far better job of pollination than we could ever hope to! Maybe the flowers have a very short window in which pollination must occur before the plant 'discards' them? My first flush of blooms did extremely well and I was able to pollinate them easily myself, but as the numbers/density increased it got more difficult and no doubt a good deal were missed. Yeah that's why outdoor plants do much better than the indoor ones (not that I have indoor ones as I don't get enough light in the house). I think ones outside do better than in the greenhouse too as the wind also helps pollination. Last year there were so few pollinating insects hand pollination was about the only choice! Wasn't great though as no sweet pepper fruit set until mid August. At least i'm 3 weeks or so ahead of that this year. Pollination will be the key and nothing beats a Bee for doing the job properly. To attract lots of Bees, one of the easiest plants to grow which they absolutely love, is Borage - one plant will have them swarming to your garden. As an added bonus, Borage is an essential ingredient for Pimms....it would be rude not to when you've got the plant to hand. Lavender sure brings 'em in too! Getting stung by a wasp however is the downside of this as I found out the other day - ouch! Wasn't sure which section to put this in, but has anyone got a recipe for cherry-plum brandy or other liqueur/alcoholic drink? I've got a tree bursting with them and every year I let them fall and rot, which seems such a waste. I'm assuming you can do things with them like Sloe Gin and brandy sprang to mind but there is little on the net about using them in cooking or drinking, apart from the usual pie or crumble? OK the problem of mice (or whatever it is) eating my crops is just getting worse. 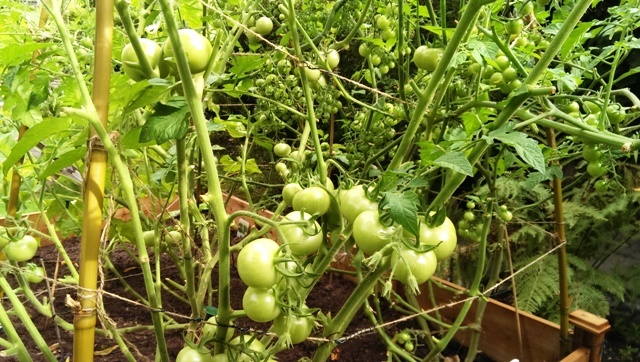 90% of ripened tomatoes have either been nibbled or completely destroyed with any remains covered in fruit flies. Now even the unripe green peppers have little holes appearing in them. I can see some fruit bits lying around the area which really makes me think of mice doing the eating. It's never been this bad before so perhaps its just the one mouse that we had in the roof over winter now taken up residence in my yard. Going to get a (humane) trap today I think as i'm going to end up with nothing/just a few manky looking bits of fruit for all the work I've put into the toms/peppers (the two plants I put the most effort into!). Got the trap and today I caught the little git! that was quick bottesford! i hope u still have some toms/peppers left. its strange that i have a mouse who lives in the garden i even feed it biscuits sometimes (its too cute i cant help it), but i've never noticed them eating my veg. I also have two young squirrels who have been visiting the garden for the past 10 days or so - but again, they dont touch the veg. now i've said that i will probably find my veg has been raided tomorrow! 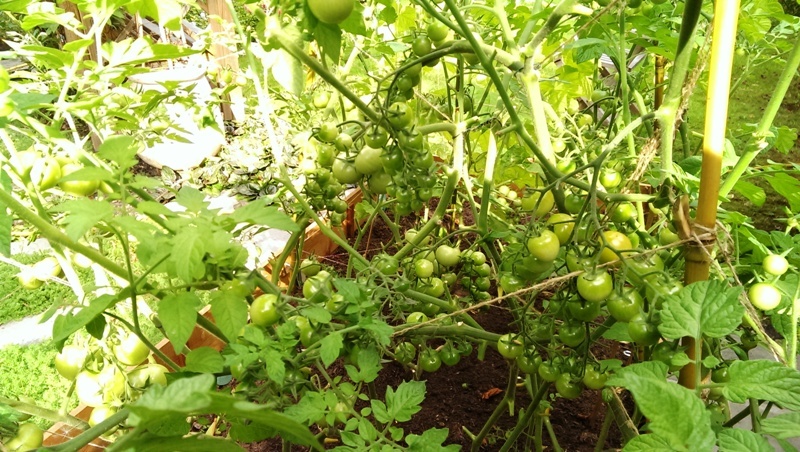 Tomatoes doing great and getting a bit of colour in them too so looks like ripening is not too far off. Two of my green chillies have turned red, but generally they are still the blandest and most disappointing chillies i've ever grown. Hoping the pressure rise for around 20th August verifies - that will be great for ripening the toms and encouraging the tiny cucumbers to grow - i've got 5 healthy looking cucumber plants and have picked a grand total of 2 cucumbers this year - again, my worst ever season for cucumbers since i started growing in 2008. Basically my parents moved here in April and found a large rubarb plant under the hedge, my mother made a crumble from a bit of it. Since then however it started to rot or something so we chopped it right back to a few inches above the ground on the main stem. With the recent weather however the last month has seen rapid growth. Basically i just want to know if i can eat it now as it looks very healthy, large and young. Question regarding rubarb.Basically my parents moved here in April and found a large rubarb plant under the hedge, my mother made a crumble from a bit of it. Since then however it started to rot or something so we chopped it right back to a few inches above the ground on the main stem. With the recent weather however the last month has seen rapid growth.Basically i just want to know if i can eat it now as it looks very healthy, large and young. Yes you can but make sure you leave a few stalks on the plant.